Our coverage of Steve Jobs’ 2005 WWDC keynote has concluded. Please visit MacCentral’s home page for the latest news from WWDC. Apple CEO Steve Jobs took the keynote stage of this week’s Worldwide Developers Conference (WWDC) in San Francisco, Calif., wearing his customary black turtleneck. While Jobs started out by offering some encouraging details about Apple’s growth and unveiled the name of Apple’s next Mac OS X release, he also dropped one of the biggest bombshells in Apple history: Apple plans a phased transition to an Intel-based processor architecture which it hopes to complete by 2007. Jobs said that WWDC 2005 is the largest gathering in the last decade of Apple developers — more than 3,800 attendees are present this week from 45 countries, including dozens from China and India. More than 500 Apple engineers have trekked into San Francisco this week to offer on-site help to those developers as well. “The number that blows my mind, we’ve got more than half a million Developer Connection members. The development community at Apple is thriving,” said Jobs. Likewise, Apple’s retail stores are pulling in impressive numbers, according to Jobs. With 109 stores open around the world, Apple is seeing more than 1 million visitors per week, he said, and has sold more than half a billion dollars in third-party products this past year. Jobs turned his focus to podcasting, which he described as “TiVo for radio” and “Wayne’s World for radio.” “We see it as the hottest thing going in radio.” And as he had previously mentioned, Jobs said that iTunes will now support podcasting directly. “We’re building a podcast directory in the iTunes Music Store,” he explained. Jobs demonstrated by navigating the itunes Music Store, clicking on a podcast link, which then displayed a directory of podcasts. Clicking on famed podcaster Adam Curry’s name presented a hierarchical list of podcasts, and Jobs then subscribed and listened to a short segment. “We think it’s going to basically take podcasting mainstream, to where anyone can do it,” said Jobs, who also noted that Apple would get into the game with its own “New Music Tuesdays” podcast. Jobs also lauded the Mac’s recent performance, compared to the rest of the computer industry. Apple has seen year over year growth in the Mac business unit for the past five quarters. “So last quarter, the Mac grew at over three times the rate of the rest of the industry,” he told attendees. Of the 2 million users of Tiger already represent 16 percent of Apple’s entire Mac OS X user base. Forty-nine percent of Mac OS X users are running Panther, and 25 percent of Mac OS X users are still running Jaguar. The remainder are “laggards on early versions of Mac OS X,” according to Jobs. Apple’s next major operating system release will be called Leopard, said Jobs. “We’re not going to be focusing on it today, but we intend to release Leopard at the end of 2006 or early 2007, right about the time Microsoft expects to release Longhorn,” he said. 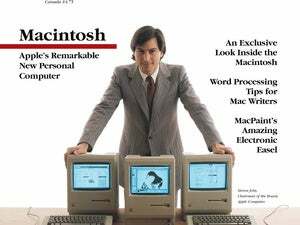 Jobs talked about the major transitions in the Mac’s life — starting from the Mac’s Motorola 68000-series processor to PowerPC. “The PowerPC set Apple up for the next decade. It was a good move,” he said. “I stood up here two years ago and promised you 3.0 GHz. I think a lot of you would like a G5 in your PowerBook, and we haven’t been able to deliver that to you,” said Jobs. “But as we look ahead, and though we’ve got great products now, and great PowerPC products still to come, we can envision great products we want to build, and we can’t envision how to build them with the current PowerPC roadmap,” said Jobs. Intel processors provide more performance per watt than PowerPC processors do, said Jobs. “When we look at future roadmaps, mid-2006 and beyond, we see PowerPC gives us 15 units of performance per watt, but Intel’s roadmap gives us 70. And so this tells us what we have to do,” he explained. Jobs demonstrated a version of Mac OS X running on a 3.6GHz Pentium 4-processor equipped system, running a build of Mac OS X v10.4.1. He showed Dashboard widgets, Spotlight, iCal, Apple’s Mail, Safari and iPhoto all working on the Intel-based system. The system itself was not revealed. Widget, scripts and Java applications should work in the new environment without any conversion, said Jobs. Cocoa-based applications will require “a few minor tweaks and a recompile.” Carbon-based applications require “a few more tweaks,” recompiling, and “they’ll work,” said Jobs. And projects built using Metrowerks’ CodeWarrior need to be moved to Xcode. The future of Mac OS X development is moving to Xcode, said Jobs. Of Apple’s top 100 developers, more than half — 56 percent — are already using Xcode, and 25 percent are in the process of switching to Xcode. “Less than 20 percent are not on board yet. Now is a good time to get on board,” said Jobs. Many developers reading this news may be thinking that they’ll have to go through the same woes they had to in order to get their Mac OS 9 applications “Carbonized” to run on Mac OS X. Jobs assured the crowd that this isn’t like that at all. To demonstrate, he brought on stage Theo Gray, cofounder of Mathematica maker Wolfram Research. Jobs demonstrated Rosetta by running Microsoft Office applications, Quicken and Photoshop CS 2 — all unmodified PowerPC-binary versions, unlike Mathematica — on the new Intel-based hardware. Intel president and CEO Paul Otellini was next on stage, greeted by Jobs with a warm embrace. “I expect there’s a whole lot of people who’d never expect you’d see that logo on this stage,” said Otellini, who launched into a story tracing the history of his company, founded in 1968, and Apple, founded in 1976 — two high-tech firms that have blossomed over the decades in Silicon Valley. Despite occasional jabs over the years, including Apple’s infamous ad where they set fire to the Intel “Bunny Man,” (an ad that was shown), Intel doesn’t hold a grudge, said Otellini. “Our strengths are different but entirely complementary. We’re about architecture, about scale and scope, and what we are most about is the relentless advancement of Moore’s Law to give you better and better machines every year. So after thirty years, Apple and Intel are together at last. I don’t think of this as a fairy tale with a happy ending. I think of this as an exciting and important story with a very happy beginning,” concluded Otellini, who then left the stage. “Apple is strong. And the Mac is strong. So this is a great time to start building for the future, to make us even stronger. We know transitions: We’ve been through two of them, and they’ve kept our platform at the forefront,” said Jobs. “And we’ll continue to be bold and begin a third transition today … to make the best machines we know how to make in the future. This transition isn’t going to happen overnight. We’re making awesome machines now, we’ve got a lot of great PowerPC products in the pipeline, but we are also working to design some Intel-based Macs, and when we’re here next year we will have them in the marketplace. And there will be a transition in the next two years. We’re getting ready. When Jobs greets developers at next year’s show, he said, he suspects many of them will already be shipping universal binaries, and Apple will keep pushing the frontiers and offering more information about Leopard. This story, "WWDC 2005 Keynote Live Update" was originally published by PCWorld.